View Co-Pack Sell Sheet Here! Our brand owners demand high quality, speed and delicious tasting product. 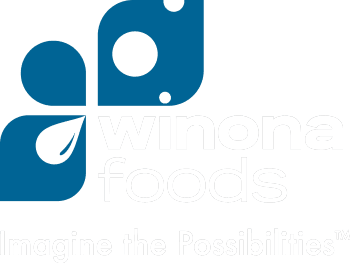 Winona Foods Inc. has been providing co-packing services since its start in 1995. We utilize our manufacturing capabilities to pack products for private label or contracted customers of other food companies. This has, and will remain, an integral part of our success and growth at Winona Foods. Our broad range of capabilities and knack for innovation combine for endless product possibilities. Currently, our core competencies include natural cheese for both food service and retail. Portion control and bulk sauces. Our newest addition to Winona Foods is a new "State-of the Art" Cold-Pack Cheese Spread line. With our in-house R&D, we can offer product concept and formula development services. We have developed a portfolio of quality solutions to the food service, Industrial and Retail trades. Winona is able to meet your expectations. High Quality products, combined with our unique and often patented packaging options, make Winona Foods your ideal partner for Co-Packing.